I realize the frustration a lot of you have regarding the availability of our calibrated microphone products and I wanted to fill everyone in on what is happening. The bulk of our microphones are processed full time by one of our staffers. That staffer has fallen extremely ill over the past few weeks; the illness has made him unable to work. We have tried to find other staff to pick up the slack (including myself), but our consulting work has required a lot of travel as of late so there is no one physically around to work on microphones. The good news is the staffer is one the mend and will attempt to start processing microphones in limited quantities over the coming days. I’m hopeful we’ll be back to full capacity by the end of June, but I can’t guarantee anything at this point. We’ll try to start selling mics in limited quantities by the end of next week, but again, no guarantees. Right now we have several cases of unprocessed mics laying around and we full well intend to get back to business as quickly as we can. In the meantime, please don’t contact us with questions about when we’ll start selling microphones again (other questions are fine). I promise that we are as anxious to start selling mics as you are to purchase them and the moment we have any news, we will update the shipping estimates on the website. In the fall of 2007 I was contracted to work on a project that required me to work with a Bruel & Kjaer 2250 sound level meter. It was my first time working with the meter, and upon receiving the instruction manual from the client, I became extremely excited. The meter had everything (on paper at least): time history logging, spectral logging, voice annotation, expandable memory via compact flash or secure digital cards, and (what I considered most important at the time), a flexible touch-screen interface that provides interactivity during measurement operations. It was everything I could have dreamed of. Looking at the screenshots in the manual, I suspected that the 2250 was built on a Windows CE platform. A quick look at the Microsoft license hologram in the battery compartment proved my suspicion to be correct. But I was still excited to try out the meter. Well, I used it for a week, and I was none too pleased with it. I believed that we could do better. Something else happened in mid 2007 - Apple released its first iPhone. I didn’t (and still don’t) own an iPhone, but at that time I had played around with it enough to see that the multitouch, stylus-free touchscreen interface was the future of portable computing. I wanted to use a meter that incorporated these technology. And I wasn’t alone. The “well-respected sound level meter developer” I was talking about in the above link is a guy named Andrew Smith. He was the brains behind TerraSonde, the manufacturer of the Audio Toolbox Plus. While at TerraSonde I emailed him a number of times with tech support questions and he demonstrated a good understandings of the standards process and a willingness to help customers. I was excited to see what he could come up with in using the iPhone (or iPod touch) as a development platform for acoustical measurement equipment. Smith formed Studio Six Digital which introduced two products last year that puts them well on their way to my Utopian vision: the AudioTools suite of iOS apps (and it is a suite, more on that later), and the iAudioInterface to provide with iPhone/iPod with a precision microphone analog input.I was able to get my hands on an iAudioInterface and a 3rd generation iPod touch (note that the iAudioInterface will not work with the current 4th generation iPhone/iPod touch or the iPad) and put it through it paces. The AudioTools app is a $20 basic audio measurement program that can also perform more advanced measurements through additional in-app modules that are available for for $8 to $60 each. The AudioTools app alone gets a recording function, a basic sound meter (basically simulating the Radio Shack analog slm), a basic 1/3 octave band meter and a basic signal generator. Available modules include FFT functions, logging sound meter, SPL “traffic light” (which triggers when a SPL threshold is met), impedance measurement tools, and many more functions. As with the Audio Toolbox hardware, the meter functions are designed to meet ANSI and IEC specifications. The iAudioInterface consists of a breakout box with a dock connector to mate with the iPhone/iPod, an included Studio Six Digital-branded microphone, line input, headphone output (for monitoring) and a mini-USB port for powering the iAudioInterface and iPhone/iPod using a 5-volt power supply. 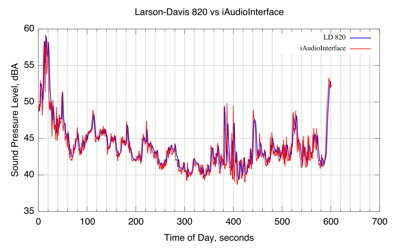 For my purposes, I want to use the iAudioInterface/AudioTools combination for unattended noise-monitoring applications. Since these measurements may have to meet legal scrutiny, the first casualty of the iAudioInterface setup is the microphone - by all accounts the mic may be suitable for non-critical (and perhaps even critical) acoustical measurement work, but since it is not spec’d to ANSI/IEC, I really can’t use it. Instead, I substituted a precision measurement microphone (BSWA MP201) and ICP power supply connected via the aforementioned line-input. Now that I have the iAudioInterface mated with a Type 1 microphone, the obvious question is: how accurate is the data that collect with this combination? 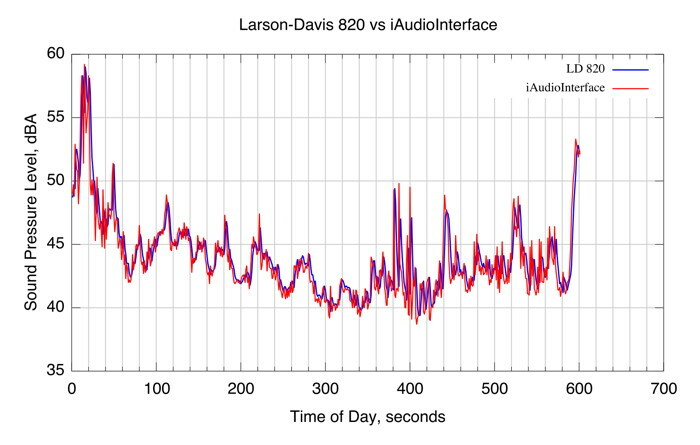 To answer this, I decided to deploy the iAudioInterface/AudioTools instrument alongside a calibrated Larson-Davis 820 integrating sound level meter. I mounted the microphones side-by-side on a microphone stand and let them run in my backyard over a March weekend (March 12-13, 2011). Both instruments were calibrated using the same acoustical calibrator and were programed to measure A-weighted sound levels and 1-second Leq’s. The verdict: the data from the two instruments were the same to well-within 1 dB. The figure posted below is typical - over this 10 minute period, it’s difficult to distinguish between the two data sets (click the plot for a larger version). The iAudioInterface + iPod touch combo sips power - after running the instrument for a weekend, there was barely in reduction in the charge of my 14V/9Ah Li-on battery. At that rate, I figure the combo could go for a couple of weeks, although I haven’t tested. Coupled with a 32 GB iPod touch, the instrument can be used for fairly long-term noise monitoring of A-weighted sound levels (as well as WAV file recording). Unfortunately the AudioTools suite doesn’t include a module for octave-band logging, but hopefully this will change in the future (I imagine that enough feature requests would convince Andrew to add it). The only downside I’ve come across is that the noise floor of the iAudioInterface line input is fairly high, such that using a mic with 25 mV/Pa sensitivity or lower will result in a noise floor around 33 dBA. Applying gain or using a more sensitive mic helps, at the cost of the microphone power supply using more power. All in all, the Studio Six Digital iAudioInterface along with an iPod touch, AudioTools software and precision microphone makes an effective long-term noise monitor. I expect that we’ll see features added to the AudioTools suite over time that will make the combination competitive with high-end meters like the B&K 2250 but at a significantly lower cost. Truth be told, when I started CSL in 2003, it wasn’t because I was one of those MIT-entrepreneur-types who wanted to start a business just for the sake of running a company. I simply wanted to do interesting work in the field of acoustics and (hopefully) make a living doing it. Starting my own business seemed, at the time, to be the best way to accomplish that. In the intervening years I’ve had ups and downs but certainly in the last 18 to 20 months business has been very successful: with the help of the folks over at Home Theater Shack my calibrated microphone business has taken off, and consulting work has also seen a serious uptick. I have been so busy that, quite frankly, I’ve had a real problem trying to keep up with the workload. I’ve been thinking for some about hiring on some help but I’ve never been able to bring myself to pull the trigger. That changed last month. I formed Cross-Spectrum Acoustics LLC with Lance Meister, a friend and colleague with whom I’ve worked before. Lance brings 16-years of transportation noise consulting, project management, and marketing experience. As a co-author of FTA’s Transit Noise & Vibration Impact Assessment guidance manual, he is one of the foremost experts in addressing rail noise and vibration issues. Combined with my own acoustical engineering and measurement experience we have a skill-set that can address the acoustical consulting needs of any number of markets. And hopefully have fun doing it. Right now, Cross-Spectrum Acoustics LLC is a separate company from Cross-Spectrum Labs, but both entities will be around to focus on different types of projects. The websites for both companies will start evolve over the coming weeks to reflect the new direction. So what’s going to change? For existing clients, not much. I will still work on existing projects under the Cross-Spectrum Labs banner and will honor existing Cross-Spectrum Labs contractual requirements. I intend for future sound & vibration consulting work to be performed under Cross-Spectrum Acoustics. The biggest changes for consulting work is that a) future clients will receive business cards with a green logo rather than a blue logo, and b) there will be other folks to help pick up the slack when I’m overwhelmed. Calibrated microphone and sound level meter sales will continue under Cross-Spectrum Labs for the foreseeable future. Microphone calibrations for OEMs and for users with their own DIY/other microphones will continue to be handled by me personally. At some point in the future I will hire someone to perform the calibration work to address demand, but only when I am sure I can find someone who will work to the standards I have set for those products. New clients, please feel free to contact me (or us) through Cross-Spectrum Labs or via and we will route you to the right place. Existing and past clients/customers, I thank you for giving me to opportunity to serve you and I hope to work with you in the future. Make no mistake - although this is a moment of transition, we are most definitely open and eager for your business.